Reader David Cavlovic has done us a big favour by finding a new audience that doesn't cough during the music or applaud between movements. Can we relocate the BBC Proms to the Mt. 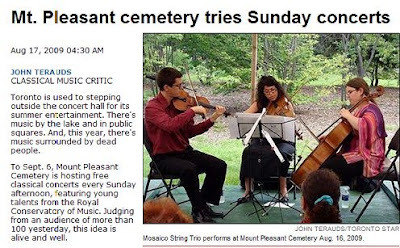 Pleasant Cemetery, Toronto, immediately? The Isle of the Dead is here. For no particular reason, my mother and I visited the historic Oakland Mountain View Cemetary, in Oakland, California, this past Sunday morning. Neither of us had ever visited it, and we had heard that it was a good place to walk (and drive) and enjoy the views out over Oakland's hills as far as San Francisco. Pliable, as I think you covered earlier, the San Francisco Bay Area new music community has been holding, for over a dozen years, an annual Summer Solstice new music festival in the now exactly 100 year old Julia Morgan-designed Oakland Columbarian.